I devour all sorts of history books—not only those about the American Civil War. Some books capture my interest enough that I go through them repeatedly. Most of these books are compiled, sorted and examined works by historians of a later generation. 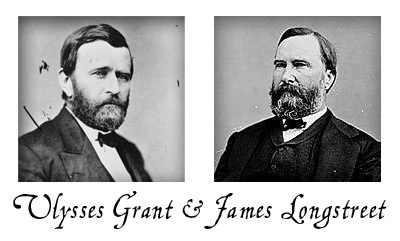 In my search for new histories, I came upon the memoirs of Grant and Longstreet at Project Gutenberg . Not only is the content of these books fascinating to me, but the prose is well-formed. These men who were raised without the most advanced of educational opportunities wrote in a clear, cohesive and interesting style. From Manassas to Appomattox, Memoirs of the Civil War in America was written by James Longstreet and published in 1896. The Personal Memoirs of U. S. Grant were written in two volumes and published shortly after Grant’s death in 1885. I am reading them side by side since they discuss events in a chronological order from opposite sides. I’ve noticed interesting details that that give insight into the authors’ ways of thinking. For example, Grant called the northern army, the National Army instead of the Union Army. As I continue my journey through these two books, I grow in gratitude that these authors shared their experiences with us. Poignant is the word I’d use to describe this reading experience.